One of my boys' favourite dishes is biryani. 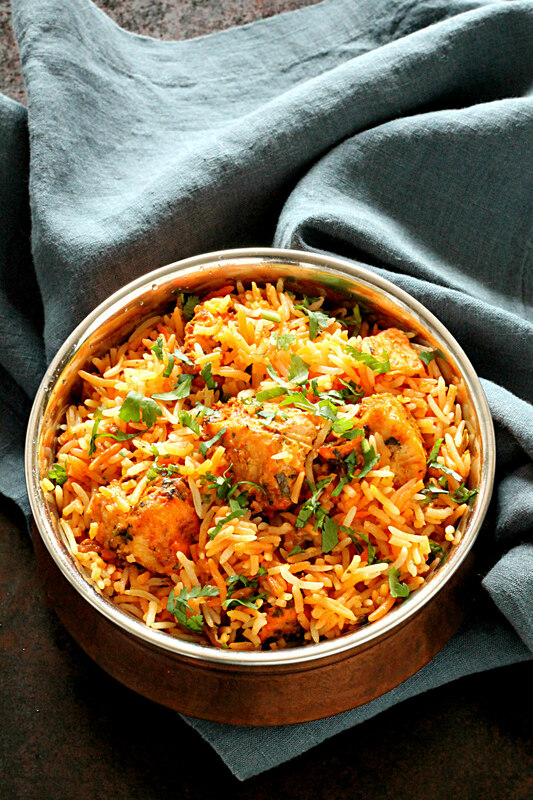 I find the traditional Hyderabadi Biryani to be the simplest and easiest to make. I found a recipe for Chicken Biryani, Dum Style in the cookbook Mangoes and Curry Leaves. It was basically the recipe for Hyderabadi Biryani. What make this type of biryani so easy, is that the meat is marinated overnight. When it's time to cook, you put the raw meat at the bottom of the pot, top with parboiled rice and bake! This recipe layers the raw meat in the rice and it all comes out perfectly. I changed things up and made a Tikka/Tandoori version and everyone fell in love. In fact, the last time I made it was for my eldest's birthday! We love to have it with plain yogurt. I hope you enjoy this recipe as much as we do! Mix together all the ingredients for the marinade. Add the chicken and mix well. For best results, marinate overnight. Wash rice and soak for at least 1/2 hour. Mix the milk with the saffron and set aside. Fill a large pot with approximately 8 cups of water. Add the salt, green cardamom, black cardamom and cinnamon stick. Bring the water to a boil. Drain the soaking rice and add to the boiling water. Boil until the rice is 3/4 cooked. Drain. In the same pot, drizzle some oil on the bottom of the pot. Add half of the marinated chicken and spread to cover the bottom of the pot. Add half of the rice and spread. Sprinkle some fried onions and chopped cilantro. Spread the remaining chicken. Top with the remaining rice. Sprinkle with some fried onion and cilantro. Using the end of a wooden spoon, make several holes by inserting the end all the way to the bottom of the pot. This allows the steam to come up quickly. Drizzle 1/4 cup oil and the saffron milk on top. Cover tightly with foil and cover with lid. Bake for 30-60 minutes. Check at the 30 minutes mark if the chicken is cooked through, rice is cooked and water has dried up at the bottom. Gently mix. Many people use a small plate to do this to avoid breaking the rice. I use a large metal spatula. Serve hot with raita or plain yogurt! That is such a delicious recipe! I love trying different varieties of biriyani but the pakki one, I am yet to try since I usually use chicken on bone and if my folks see it, they may freak out... but I must try this one... sounds lipsmacking! Thank you Rafeeda! Let me know if you give it a try! I have this book and I love it but I think I'm going to try your recipe instead. Sounds so delicious! So glad to hear!!! And I agree...kacchi is way easier! Hope you see this. I have boneless chicken thighs at home. Can I use them for this recipe? Do I have to change the cooking time? You can use thighs. I've never cooked boneless thighs so I'm not sure about cooking time. I would say check at 30 minutes to see if it is cooked and if the rice is done.